For other uses, see Frying pan (disambiguation). "Skillet" redirects here. For the Christian rock band, see Skillet (band). A stainless steel frying pan. 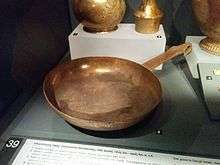 Copper frying pan dated 5th to 4th century B.C., Archaeological Museum of Thessaloniki. The handle is ornamented with floral engravings and ends up in the shape of a goose head. A versatile pan that combines the best of both the sauté pan and the frying pan has higher, sloping sides that are often slightly curved. This pan is called a sauteuse (literally a sauté pan in the female gender), an evasée (denoting a pan with sloping sides), or a fait-tout (literally "does everything"). Most professional kitchens have several of these utensils in varying sizes. A grill pan is a frying pan with very low sides, with a series of parallel ridges in the cooking surface or a removable metal grid. A grill pan cooks food with radiant heat (like a grill) on a stovetop. It is referred to as a "griddle pan" in British English. A "rappie pan" is a pan used to make rappie pie, an Acadian potato dish. The pan is made from Aluminum or Stainless Steel. A coating is sometimes applied to the surface of the pan to make it non-stick. Frying pans made from bare cast iron or carbon steel can also gain non-stick properties through seasoning and use. A process for bonding Teflon to chemically roughened aluminum was patented in France by Marc Gregoire in 1954. In 1956 he formed a company to market non-stick cookware under the "Tefal" brand name. The durability of the early coatings were poor, but improvements in manufacturing have made these products a kitchen standard. The surface is not as tough as metal and the use of metal utensils (e.g. spatulas) can permanently mar the coating and degrade its non-stick property. For some cooking preparations a non-stick frying pan is inappropriate, especially for deglazing, where the residue of browning is to be incorporated in a later step such as a pan sauce. Since little or no residue can stick to the surface, the sauce will fail for lack of its primary flavoring agent. Non-stick frying pans featuring teflon coatings may give off toxic fumes, as the coating decomposes when heated beyond approximately 240 °C (464 °F). Such temperatures can be reached within minutes. An electric frying pan or electric skillet incorporates an electric heating element into the frying pan itself and so can function independently off of a cooking stove. Accordingly, it has heat-insulated legs for standing on a countertop. (The legs usually attach to handles.) Electric frying pans are common in shapes that are unusual for 'unpowered' frying pans, notably square and rectangular. Most are designed with straighter sides than their stovetop cousins and include a lid. In this way they are a cross between a frying pan and a sauté pan. A modern electric skillet has an additional advantage over the stovetop version: heat regulation. The detachable power cord/unit incorporates a thermostatic control for maintaining the desired temperature. With the perfection of the thermostatic control, the electric skillet became a popular kitchen appliance. Although it largely has been supplanted by the microwave oven, it is still in use in many kitchens. The cooking surface of a frying pan is typically coated with a layer of oil or fat when the pan is in use (though greasy foods like bacon do not need additional oil added). In pan-frying, a layer of oil has four functions: it lubricates the surface; increases contact between the food and the pan; acts as a thermal mass to reduce cooking time; and increases flavour and colour. The depth of the oil will vary depending on the food being cooked. When frying battered fish or chicken, for example, the oil generously covers the inner pan surface, but when frying pancakes, the oil is but a thin film to keep the batter from sticking. Some frying techniques do not require added oil. "Blackening" dredges the food itself in fat, and uses a layer of spices to keep the food from sticking to the pan. These recipes also call for an intensely heated pan, which quickly sears the food being cooked. Cast iron and carbon steel frying pans must be seasoned before use and periodically afterwards, and should be cleaned with care not to remove the seasoned coating. 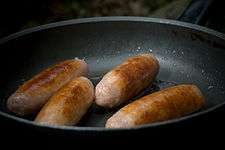 Frying pans made from copper are tinned to prevent toxic reactions between the copper and the food being cooked and may occasionally need re-tinning. Some cooks also polish the exterior to remove tarnish. Uncoated aluminium and stainless steel frying pans require very little maintenance. Frying pans with non-stick coatings such as Teflon cannot safely be heated past the decomposition point of their coatings (about 260 °C (500 °F), though high-heat coatings are available). See Non-stick frying pans above. ↑ "Pan - Definition and More from the Free Merriam-Webster Dictionary". ↑ "Chemistry of Cast Iron Seasoning: A Science-Based How-To". ↑ Houlihan 2003 "DuPont studies show that the Teflon offgases toxic particulates at 464 °F. At 680 °F Teflon pans release at least six toxic gases, including two carcinogens, two global pollutants, and MFA, a chemical lethal to humans at low doses." ↑ Good Eats, Ep. 815 "Myth Smashers"
↑ Houlihan 2003 "...a generic non-stick frying pan preheated on a conventional, electric stovetop burner reached 736 °F in three minutes and 20 seconds..."